TechniTrader.com Webinar review - by Del B. - "I learned more in that 50 minutes (TechniTrader.com Webinar) than a year of seminars." Let Martha know I learned more in that 50 minutes (TechniTrader.com Webinar) than a year of Worden seminars. Not dissing Worden but I have had so much training from Martha that it makes sense so much faster with her instructing live. Fantastic (TechniTrader.com Student Mentoring) webinar! It is so helpful to see exactly how Martha goes through her scans and analysis on the stocks presented. It is also encouraging to know that I am doing it somewhat correctly. TechniTrader Stock Trading Options Webinar review - by Karen S. - "As always, TechniTrader has gone above and beyond. Your attention to training and simplification makes your company such a great asset to me." Thanks so much for this terrific (TechniTrader.com Options) webinar! I am hopeful that the webinar was archived so that I can watch it again, and I will be anxious to receive the Options calculator! I have traded Options very little because I was always confused as to what to do and when to do it. Howard took all the guess work and complicated analysis out of the equation. I am excited to add this to my trading tool chest and begin paper trading this great new tool. As always, TechniTrader has gone above and beyond. Your attention to training and simplification makes your company such a great asset to me. TechniTrader.com Stock Trading Course Mentoring Webinar review - by Rebecca S. - "It gives me courage each time to think I can actually do this." Once again, my thanks to Martha for another good (TechniTrader.com Student Mentoring) webinar. These are helpful. It gives me courage each time to think I can actually do this. TechniTrader.com Student Mentoring Webinar review - by Michael C. - "It is always great to read what Martha is teaching, however when she answers questions and explains (TC2000 Balance of Power Indicator) BOP and how it relates to the Market Participants, this knocks it out of the park." Last night was fantastic (TechniTrader.com Student Mentoring Webinar). It is always great to read what Martha is teaching, however when she answers questions and explains (TC2000 Balance of Power Indicator) BOP and how it relates to the Market Participants, this knocks it out of the park. I am looking forward to a retake of the (Balance of Power Indicator Study class) BOP class, this is such an important indicator that sets the trade up. (Time Segmented Volume Indicator Study class) TSV is a close second, however I believe the real money lies in understanding BOP well. Anyhow, thank you for a great webinar and thank you to Martha for taking the time to answer questions that must at time seem elementary in nature. TechniTrader Stock Trading Course Mentoring Webinar review - by Gillian J. - "I am so enjoying this fascinating journey and really, it is because of you. You're the best." As always, your (TechniTrader Instructor Martha Stokes CMT) timing is perfect. I was just wondering about MLR and your explanation arrives. The (TechniTrader.com Student Mentoring) webinar was extremely helpful and it was most consoling to hear that this is indeed a difficult market. I also appreciated the format, length and study guide which will be great for reviewing later. Thank you so much for your enthusiasm and dedication. I am so enjoying this fascinating journey and really, it is because of you. You're the best. TechniTrader.com Stock Trading Mentoring Webinar "Trade Management Planner" review - by John D. - "Howard's review of the mechanics of picking stocks and trading, probably for me that was one of the most helpful things." Thanks so much for the (TechniTrader.com Trade Management Planner) webinar. I really enjoyed and learned several things in the webinar. I really appreciate Howard’s (Howard Johnson) review of the mechanics of picking stocks and trading, probably for me that was one of the most helpful things. The information on what is going on in the world economy by Martha (TechniTrader Insructor Martha Stokes CMT) is very helpful as well. She always has such a great insight on the economy. Martha’s review of the Dow30 was very helpful, just watching, listening, and seeing how she goes through stocks quickly deciding what it looks like they are doing and moving on. As you might have gathered I tend to go through stocks and labor over what they are doing, looking at different chart templates and agonizing over whether they are good ones or not. With this training I have a new goal and that is to speed up my scan/watchlist review to narrow down picks to a short list then look closer. I really appreciate you giving up a Saturday, in the winter to teach this class. It was the perfect time for me as many of the offerings during week days are difficult for me to work into my schedule. The (TechniTrader.com Student Mentoring) webinar was excellent. It was helpful to see how Martha Stokes CMT goes through her analysis, the indexes, and her comments. I hope there are more focused webinars in the future. I am a loyal TechniTrader student, and Mele and Martha are my mentors. I still have a long way to go. Thanks for the webinar, and I appreciate Mele and Martha. TechniTrader.com Stock Trading Mentoring Webinar review - by Virginia P. - "Thank you so much Martha, for your expertise and your time." Just a quick note to tell you that I enjoyed the (TechniTrader.com Student Mentoring) Webinar today and, of course learned more about various aspects of the Stock Market. Thank you so much Martha, for your expertise and your time. TechniTrader.com Stock Trading Mentoring Webinar review - by Michael C. - "the training you all give is so valuable and I see the foolishness that is being touted in the media and by traders." 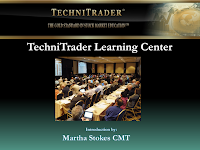 I want to thank Martha (Martha Stokes CMT) for an excellent (TechniTrader.com Student Mentoring) webinar. This is so important to hear Martha talking about what she sees and how she goes about looking at the stock. It is one thing to read and listen to recordings (TechniTrader Methodoogy Essentials Standard Course manual and DVDS) but it just does not capture the moment quite like the live webinar. I find it interesting to view stock gurus from a year ago and to see just how much fluff they spin. I am still just a newbie however, the training you all give is so valuable and I see the foolishness that is being touted in the media and by traders. I am not being disrespectful when I say that many so called stock experts could use some of your training. Heck, I find myself looking at some of their recommendations and asking myself, are they trying to sell me their shares? That is how bad it is now. I have so much to learn still but "Thank you, Thank you"! !